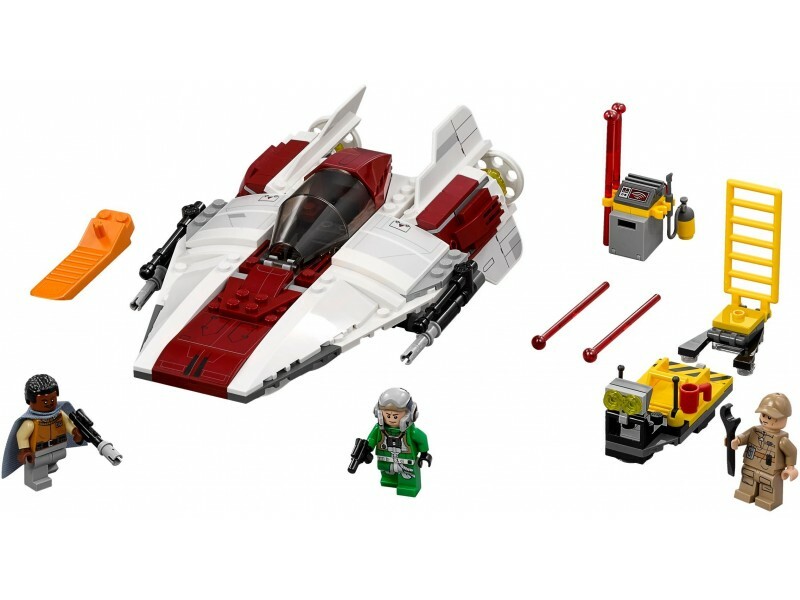 Launch into LEGO® Star Wars missions with the high-speed A-Wing Starfighter, featuring an opening minifigure cockpit, retractable landing gear, rotating laser cannons and dual spring-loaded shooters. There’s also a service cart loaded with tools, extra ammo and a detachable access ladder to load the A-Wing Pilot into position. Includes three minifigures. Includes three minifigures: Lando Calrissian, an A-Wing Pilot and a Rebel Ground Crew. Features an A-Wing Starfighter and a service cart. A-Wing Starfighter features an opening minifigure cockpit, retractable landing gear, rotating laser cannons and two spring-loaded shooters. Service cart features a detachable access ladder, toolbox, wrench, welding apparatus, cup and extra ammo. Weapons include Lando's special blaster and the A-Wing Pilot's blaster pistol. This set offers an age-appropriate build and play experience for ages 8-14. A-Wing Starfighter measures over 2” (7cm) high, 7” (20cm) long and 4” (12cm) wide. Service cart measures over 2” (7cm) high, 3” (9cm) long and 1” (3cm) wide.